Yes, yes, yes, my first news post in … um … months. But it’s an exciting one. 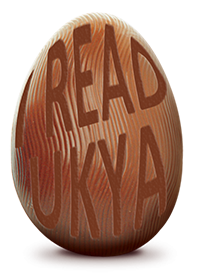 UKYA (young adult literature written by writers living in the united kingdom) is a wonderful world to inhabit. And today, you get the chance to find out some more about some of the authors who write it. And win dozens of free signed books, including some by me! I do. One of my favourite authors is Hilary McKay. Hello, egg-hunters! My name is Sally Nicholls and I’ve written a bunch of UKYA books, all very different – ‘Ways to Live Forever‘ (about a boy with leukaemia), ‘Season of Secrets‘ (which is more middle-grade really, about a girl who meets a wounded pagan god), ‘All Fall Down‘ (a historical apocalypse novel set in 1349 about the Black Death) and ‘Close Your Pretty Eyes‘, (about a girl who moves to a house haunted by the ghost of Victorian mass-murderess Amelia Dyer). My favourite UKYA is Dodie Smith’s ‘I Capture the Castle’. Love that book. I told my brother Jonathan I was going to write a book about all the things that happened to us last year. About the home-made spaceships, and the lock-pickers, and the thermal lances, and the exploding dishwasher, and the island that was old when the Vikings came, and Auntie Irene’s treasure, and all the things that happened before we found it. I told Jonathan that people didn’t put grenades through your window just because of what you called your book. But Jonathan said you shouldn’t underestimate the rage of a fandom. “Look at Star Wars fans,” he said. “I would totally put a grenade through George Lucas’s window if I thought it would get him to take Jar Jar Binks out of The Phantom Menace.” Which seems a little harsh given how much Jonathan loves Star Wars, but Jonathan said you should never expect logic from a fanatic, which is probably true. So I said I’d tell people at the beginning of the book that the title wasn’t about a real island, but a metaphorical one (although there is a real island in the story – several in fact), and also not to put grenades through my window, but send cake instead. For my top ten UKYA novels, go here. For the next blog in the Easter Egg Hunt, go here. And good luck!